well, weeds are not an issue either,put down under mulch to keep weeds from growing. The bed is simple to set up, with no installation required. Just unfold, fill and plant! Raised bed kits or purchasing lumber to create a raised bed can cost hundreds of dollars, plus you have to install it. The plant bed is very inexpensive and also reusable year after year!! An amazing way to grow veggies without the hassle of an in-ground garden. You will be more grateful that you purchase it! as a flower pot, grow tomatoes,potato, herbs & more. 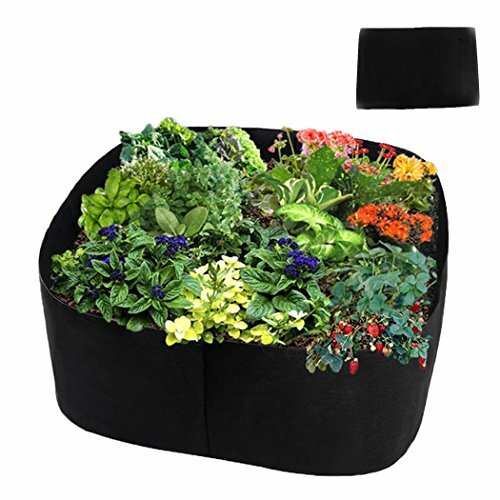 Easy to add the soil and planter what you need! It's not square fully, it's more roundish when you filled it up! Great gardening item for make your yard all-ordered! Please allows 0.5-1 inches in error due to the manual measurement. If you have any questions about this product by Asunflower, contact us by completing and submitting the form below. If you are looking for a specif part number, please include it with your message.